Plants have played an important role in the treatment of many diseases, especially in the East region countries. Drugs, which are of plant origin and used to treat diseases to attain or maintain the condition of improved health are known as Herbal drugs. , Traditional medicine has its roots, grounded deep in India and is being used here since times immemorial. Ayurvedic medicine (Ayurveda = the science of life) is a system of Hindu traditional medicine native to the Indian subcontinent and a form of alternative medicine. It has also attracted much attention in developed countries such as Europe, United States and Japan. , Ayurveda stresses the use of plant-based medicines and treatments. These medicines are not only used for the treatment of systemic diseases, but the natural phytochemicals in them offer an effective alternative to antibiotics and represent a promising approach in the prevention and therapeutic strategies for oral infections too. Ayurveda has mentioned various procedures for maintaining oral hygiene and gingival health. The stem, bark, root and young fruits of Melia azadirachtaare used as bitter, tonic, antiseptic, astringent, and antibacterial. Neem twigs as tooth brush, Azadirachta indica as mouth wash. These herbal medicines help in maintaining good oral health and thus can be used for the treatment of periodontal diseases which are recognized as a major public health problem throughout the world and are the most common cause of tooth loss in adults. , Thus, a systematic review was conducted to evaluate the effect of various medicinal herbs on the periodontal health. To assess the effect of various medicinal herbs on the periodontal health. The articles are emphasizing on the efficacy of herbs on periodontal diseases. Studies on diseases other than periodontal disease. Published literature on recent developments in research on effect of herbs on periodontal disease, including original articles and papers in PubMed Central Databases were taken into study for the review on 4 th of December 2013 up to 15 th December 2013. A literature review was performed using MeSH terms herbal medicine, periodontitis and dentistry. With this combination total of 368 abstracts appeared. 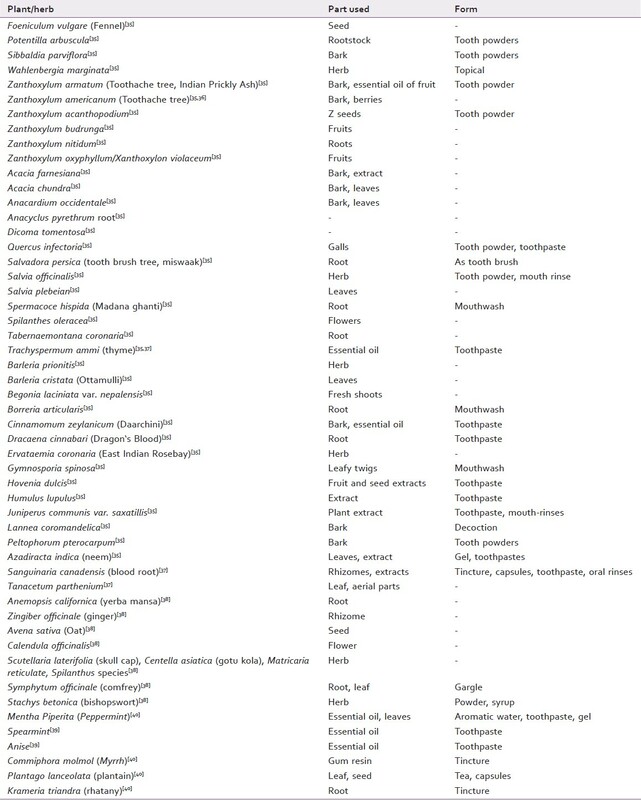 Of these 39 abstracts were related to the research question that is "In patients with periodontal disease does herbal products, compared with commercially available nonherbal, reduce the effect of periodontitis?." Further inclusion and exclusion criteria were applied to these articles. Thirteen articles that fulfilled the criteria's were selected for the review. Five articles that were hand searched were also included in the review. 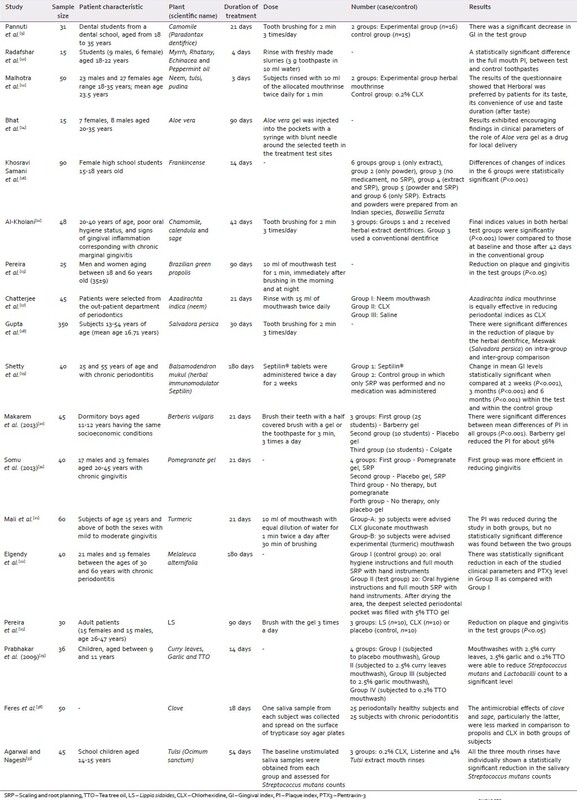 Thus, a total of 18 full-text articles were retrieved for the review [Table 1]. Reported data were analyzed and represented in the form of figures and tables for the current review. Electronic Search (total articles) =13 (dated 4-15 th December 2013). The present review revealed a growing interest in the use of herbs in dentistry, particularly in periodontal diseases. Herbal medicines have been used for many years, and their history can be rooted from the ancient civilization, where their role as a primary source of medication have been evident [Table 2]. There are a number of herbs that can help eliminate inflammation and infection associated with periodontal diseases. Coenzyme Q-10, a natural supplement helps to increase tissue oxygenation in the body that helps to provide healthy blood flow to the gums. A reported clinical trial demonstrated improvement in plaque and calculus levels by twice a day intake of 25 mg of Coenzyme Q-10 in patients suffering from periodontal disease. Researchers should be encouraged to conduct controlled studies to prove the effectiveness and safety of natural dental products. Those studies will provide dentists with sufficient clinical evidence before prescribing promoted natural products for their patients. The low toxicity and low cost of these herbs should encourage further investigation leading to a better understanding of traditional herbal medicine for prevention of plaque formation and strengthening of the gums, as well as in reducing the incidence of dental or periodontal infections. Thus, doing further researches in this field, will provide more data and will prove to be helpful in studying the effects of various herbal medicinal plants on periodontal diseases. The use of herbal medicine continues to expand rapidly across the world. Many people take herbal medicines or herbal products now for their health care in different national healthcare settings. Herbal extracts have been used in dentistry for reducing inflammation, as antimicrobial plaque agents, for preventing the release of histamine and as antiseptics, antioxidants, antimicrobials, antifungals, antibacterials, antivirals and analgesics. They also aid in healing and are effective in controlling microbial plaque in gingivitis and periodontitis and thereby improving immunity. Hoseini HF, Fakhrzadeh H, Larijani B, Shikhsamani A. Review of anti-diabetic medicinal plant used in traditional medicine. J Med Plant 2006;5 Suppl 2:1-8. Chaturvedi TP. Uses of turmeric in dentistry: An update. Indian J Dent Res 2009;20:107-9. Holetz FB, Ueda-Nakamura T, Dias Filho BP, Mello JC, Morgado-Díaz JA, Toledo CE, et al. Biological effects of extracts obtained from Stryphnodendron adstringens on Herpetomonas samuelpessoai. Mem Inst Oswaldo Cruz 2005;100:397-401. Hartzell JF, Zysk KG. Health, science, and the spirit: Veda and Âyurveda in the Western world. J Altern Complement Med 1995;1:297-301. Mattick CR. Stomatology - An intriguing blend of traditional Chinese medicine and Western-style dentistry. Br Dent J 1995;178:350-3. Singh J, Kumar A, Budhiraja S, Hooda A. Ethnomedicine: Use in dental caries. Braz J Oral Sci 2007;6:21. Kadam A, Prasad BS, Bagadia D, Hiremath VR. Effect of Ayurvedic herbs on control of plaque and gingivitis: A randomized controlled trial. Ayu 2011;32:532-5. Kumar P, Ansari SH, Ali J. Herbal remedies for the treatment of periodontal disease - A patent review. Recent Pat Drug Deliv Formul 2009;3:221-8. Pannuti CM, Mattos JP, Ranoya PN, Jesus AM, Lotufo RF, Romito GA. Clinical effect of a herbal dentifrice on the control of plaque and gingivitis: A double-blind study. Pesqui Odontol Bras 2003;17:314-8. Radafshar G, Mahboob F, Kazemnejad K. A study to assess the plaque inhibitory action of herbal-based toothpaste: A double blind controlled clinical trial. J Med Plants Res 2010;4:1182-6. Al-Kholani AI. Comparison between the efficacy of herbal and conventional dentifrices on established gingivitis. Dent Res J (Isfahan). 2011;8:57-63. Malhotra R, Grover V, Kapoor A, Saxena D. Comparison of the effectiveness of a commercially available herbal mouthrinse with chlorhexidine gluconate at the clinical and patient level. J Indian Soc Periodontol 2011;15:349-52. Pereira EM, da Silva JL, Silva FF, De Luca MP, Ferreira EF, Lorentz TC, et al. Clinical evidence of the efficacy of a mouthwash containing propolis for the control of plaque and gingivitis: A phase II study. Evid Based Complement Alternat Med 2011;2011:750249. Bhat G, Kudva P, Dodwad V. Aloe vera: Nature's soothing healer to periodontal disease. J Indian Soc Periodontol 2011;15:205-9. George D, Bhat SS, Antony B. Comparative evaluation of the antimicrobial efficacy of Aloe vera tooth gel and two popular commercial toothpastes: An in vitro study. Gen Dent 2009;57:238-41. Khosravi Samani M, Mahmoodian H, Moghadamnia A, Poorsattar Bejeh Mir A, Chitsazan M. The effect of Frankincense in the treatment of moderate plaque-induced gingivitis: A double blinded randomized clinical trial. Daru 2011;19:288-94. Chatterjee A, Saluja M, Singh N, Kandwal A. To evaluate the antigingivitis and antipalque effect of an Azadirachta indica (neem) mouthrinse on plaque induced gingivitis: A double-blind, randomized, controlled trial. J Indian Soc Periodontol 2011;15:398-401. Gupta P, Agarwal N, Anup N, Manujunath BC, Bhalla A. Evaluating the anti-plaque efficacy of meswak (Salvadora persica) containing dentifrice: A triple blind controlled trial. J Pharm Bioallied Sci 2012;4:282-5. Shetty S, Bose A, Sridharan S, Satyanarayana A, Rahul A. A clinico-biochemical evaluation of the role of a herbal (Ayurvedic) immunomodulator in chronic periodontal disease: A pilot study. Oral Health Dent Manag 2013;12:95-104. Makarem A, Khalili N, Asodeh R. Efficacy Of barberry aqueous extracts dental gel on control of plaque and gingivitis. Acta Med Iran 2007;45:90-4. Elgendy EA, Ali SA, Zineldeen DH. Effect of local application of tea tree (Melaleuca alternifolia) oil gel on long pentraxin level used as an adjunctive treatment of chronic periodontitis: A randomized controlled clinical study. J Indian Soc Periodontol 2013;17:444-8. Pereira SL, Praxedes YC, Bastos TC, Alencar PN, da Costa FN. Clinical effect of a gel containing Lippia sidoides on plaque and gingivitis control. Eur J Dent 2013;7:28-34. Thomas B, Shetty SY, Vasudeva A, Shetty V. Comparative evaluation of Antimicrobial Activity of Triphalâ and commercially available Toothpastes: An in-vitro study. Int J Public Health Dent 2011;2:8-12. Benefits of Tulsi (Basil) in Health, Health Center. Available from: http://www.howtocare4me.wordpress.com/2012/11/23/benefits-of-tulsi-in-health/. [Last cited on 2014 Apr 28]. Health Benefits of Clove Oil, Organic Facts. Available from: http://www.organicfacts.net/organic-oils/natural-essential-oils/health-benefits-of-clove-oil.html. [Last cited on 2014 Apr 29]. Anti Inflammatory and Analgesic Effect of Ginger Powder in Dental Pain Model-Full Text View - Clinical Trials.gov. Available from: http://www.clinicaltrials.gov/show/NCT01429935. [Last cited on 2014 Apr 29]. Fani MM, Kohanteb J. Inhibitory activity of Cinnamomum zeylanicum and eucalyptus globulus oils on Streptococcus mutans, Staphylococcus aureus, and Candida species isolated from patients with oral infections. J Dent Shiraz Univ Med Sci 2011;11:14-22. Prabhakar AR, Ahuja V, Basappa N. Effect of curry leaves, garlic and tea tree oil on Streptococcus mutans and Lactobacilli in children: A clinical and microbiological study. Pesqui Bras Odontopediatria Clín Integr 2010;9:259-63. Math MV, Balasubramaniam P. Curry leaves. Br Dent J 2004;197:519. Motamayel FA, Hassanpour S, Alikhani MY, Poorolajal J, Salehi J. Antibacterial effect of eucalyptus (globulus labill) and garlic (Allium sativum) extracts on oral Cariogenic bacteria. J Microbiol Res Rev 2013;1:12-17. Feres M, Figueiredo LC, Barreto IM, Coelho MH, Araujo MW, Cortelli SC. In vitro antimicrobial activity of plant extracts and propolis in saliva samples of healthy and periodontally-involved subjects. J Int Acad Periodontol 2005;7:90-6. Agarwal P, Nagesh L. Comparative evaluation of efficacy of 0.2% Chlorhexidine, Listerine and Tulsi extract mouth rinses on salivary Streptococcus mutans count of high school children - RCT. Contemp Clin Trials 2011;32:802-8. Somu CA, Ravindra S, Ajith S, Ahamed MG. Efficacy of a herbal extract gel in the treatment of gingivitis: A clinical study. J Ayurveda Integr Med 2012;3:85-90. Khare CP, editor. Indian Medicinal Plants. Berlin: Springer-Verlag; 2007. p. 6-731. Barnes J, Anderson LA, Phillipson JD. Herbal Medicines. 3 rd ed. London: Pharmaceutical Press; 2007. p. 84-6. Gümü G. Periodontal Disease. Available from: http://www.turker_a.web.ibu.edu.tr/bio319/Gunduz/Periodontal%20diseases.ppt. [Last accessed on 2013 Dec 31; Last updated on 2013 Nov 24]. Soliman KM, Badeaa RI. Effect of oil extracted from some medicinal plants on different mycotoxigenic fungi. Food Chem Toxicol 2002;40:1669-75. Herbal Remedies for Periodontal Disease. Available from: http://www.altmd.com/Articles/Herbal-Remedies-for-Periodontal-Disease. [Last accessed on 2013 Nov 25; Last updated on 2012 Apr 18].